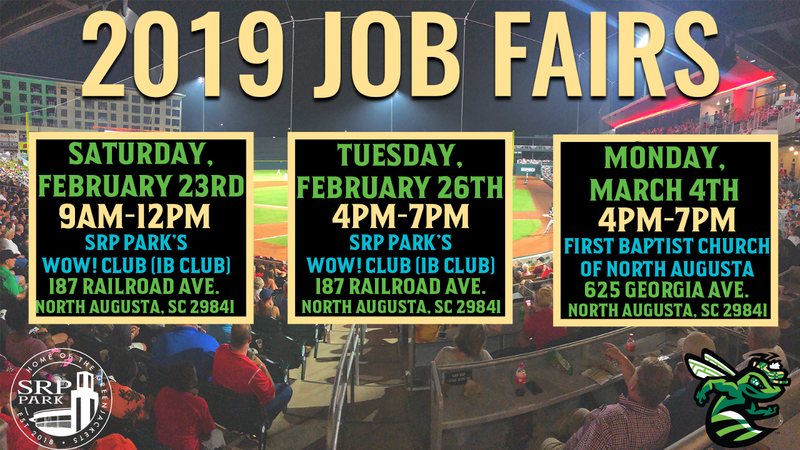 NORTH AUGUSTA, SC: The Augusta GreenJackets, South Atlantic League affiliate of San Francisco Giants, will be hosting three game day job fairs in anticipation of the 2019 season at SRP Park. All three of the job fairs are open to all positions that the GreenJackets are hiring for (retail cashiers, parking attendants, on-field assistants, mascots, ushers, video board operators, concession stand cooks & cashiers, servers, bat boys, fun zone attendants, ticket takers, and more). The team is searching for individuals who are fan-friendly, outgoing, hardworking, and willing to have FUN to join the GreenJackets game day staff for the 2019 baseball season. "We pride ourselves in having the best guest experience with the help of our entire staff," General Manager Brandon Greene said. "In 73 days we will join all of our new staff at our first GreenJackets game of 2019!" All applicants must be at least 16 years of age or older. Applicants who cannot make it to one of the three job fairs can come by SRP Park and fill out a potential job application for the 2019 season. If there are available spots left, the GreenJackets will contact the applicant. For more information visit GreenJacketsbaseball.com or call (803) 349-9467.